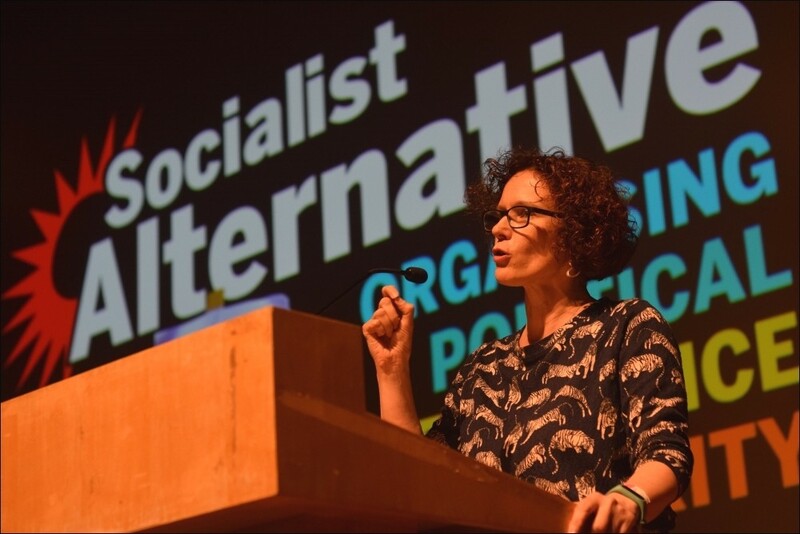 Socialism 2018 was a festival of debate that focused attendees, new and experienced, on the Socialist Party's perspective that we are preparing for big movements of working class people against the daily proof that a socialist alternative to capitalism is necessary. That determination was expressed in the £35,000 raised in the financial appeal - but also in the intensity of discussion in the workshops, the throng around the bookshop at every break and the interest among first time attenders in joining the Socialist Party. 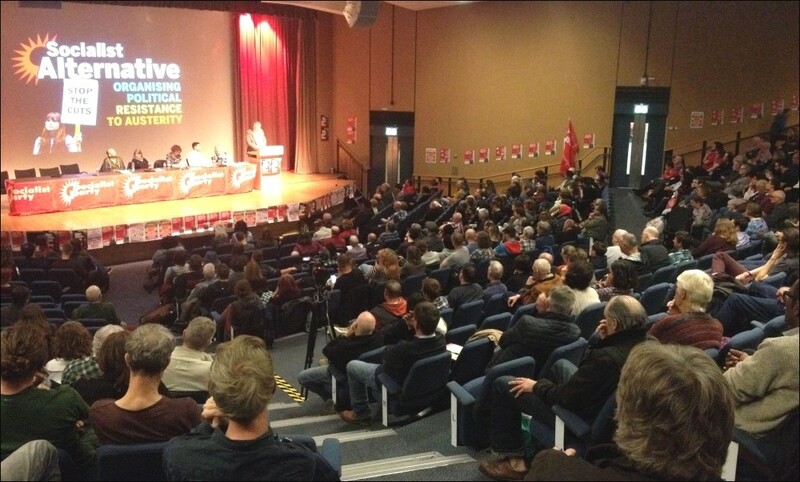 "The aim of this rally is to provide the ideas to fight back and win for the working class in Britain and internationally. That means the fight for a socialist alternative to the chaos of capitalism". 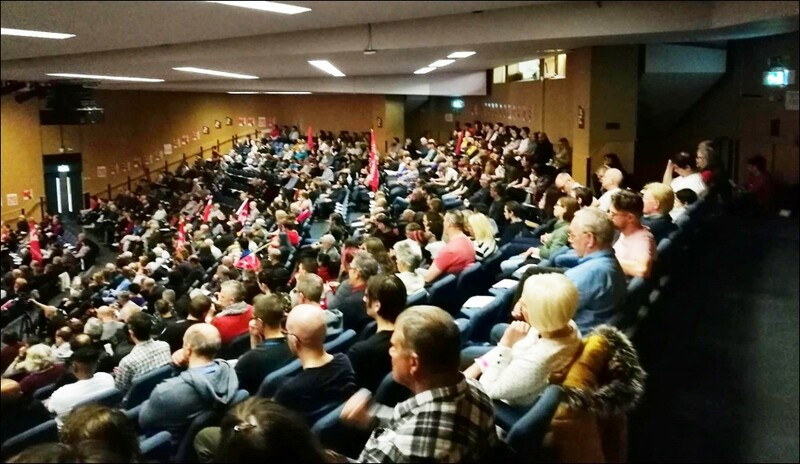 This was how Sarah Sachs-Eldridge, the Socialist Party's national organiser, summarised the purpose of Saturday night's rally to a packed and buzzing Logan Hall. Applause interrupted Sarah's opening sentences. This set the tone for the whole event. 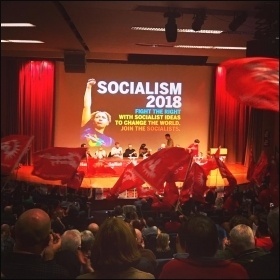 Enthusiastic clapping, whooping and flag waving greeted every speaker when they described how working-class people can fight back against austerity and capitalism. 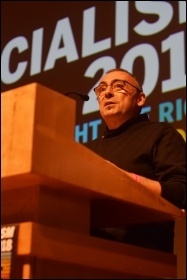 Chris Baugh, the assistant general secretary of the civil servants' union PCS, was the first to take the stage speaking in a personal capacity. He is currently standing for re-election to his position, defending the principles of lay-democracy and fighting trade unionism against a challenge from PCS president Janice Godrich - who is backed by the union's general secretary Mark Serwotka. Chris explained that this challenge is in reality a "political attack on the Socialist Party, which is damaging to both the left and the union, and which will be celebrated only by the enemies of the union and the employer." He went on to explain: "We have won support from across the union for our election campaign which is based on our record: on union democracy, on a leadership that's prepared to learn the lessons of the pay ballot - about how we mobilise members to secure the necessary legal mandate for industrial action, how we link the fight on pay with the stream of attacks on jobs and conditions. And how, on the one hand, we can build through the TUC, as well as work directly with those unions that are preparing to fight, to build the mass action that can defeat an enfeebled Tory government." Next to address the crowd was Denise Phillips, the secretary of home care in Glasgow City Unison, and a leader of the 8,500 mostly women workers who've taken historic strike action in the city to fight for equal pay. To a tremendous applause she boldly stated "this is not a bonus, it is money we rightly deserve from a council that has been robbing us for years... If there is no progress we will be back out on strike." Juan Ignacio Ramos, general secretary of Izquierda Revolucionaria (IR) which is the Socialist Party's sister organisation in the Spanish state, picked up this thread from Denise. He described the huge strikes and movements taking place there - the failure of the new 'socialist' government to deliver social peace for Spanish capitalists. "The state is demanding 25 years in prison for the crime of putting ballot boxes in schools and libraries". IR has "intervened with all its forces to push the movement forward and push consciousness forward", fighting for self-determination for the people of Catalonia and raising the need for a united struggle with workers across the Spanish state for socialist change. Once applause for Juan Ignacio's fiery speech died down, Sarah introduced Hugo Pierre, a member of public sector union Unison's NEC, speaking in a personal capacity. Hugo focused on the Windrush outrage and the fight against racism. "The hostile environment policy was introduced by a government desperate to drive home austerity and compete with UKIP on immigration" he explained. He went on to argue for a united struggle of all working class people to demand jobs, homes and services, not racism - arguing that trade unions must play a central role in this struggle. The penultimate, keynote speech was delivered by Peter Taaffe, general secretary of the Socialist Party. 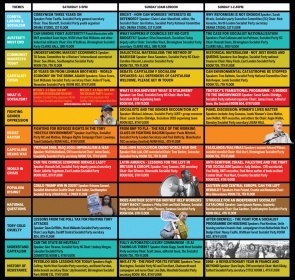 Peter drew together the threads outlined by previous speakers, outlining the central tasks facing the workers' and socialist movement in the next period. Describing the situation in Britain and the Socialist Party's approach, Peter said: "It's possible that a general election could be forced within a matter of weeks... There's a yearning by the mass of people in Britain to see the end of this government, and a growing hostility to anything that stands in the way of a Corbyn-led government. "But the mood is not entirely uncritical towards Corbyn or McDonnell. There's an impatience now among the more politically developed sections of the working class, who see prevarication at the top and capitulation to the right... 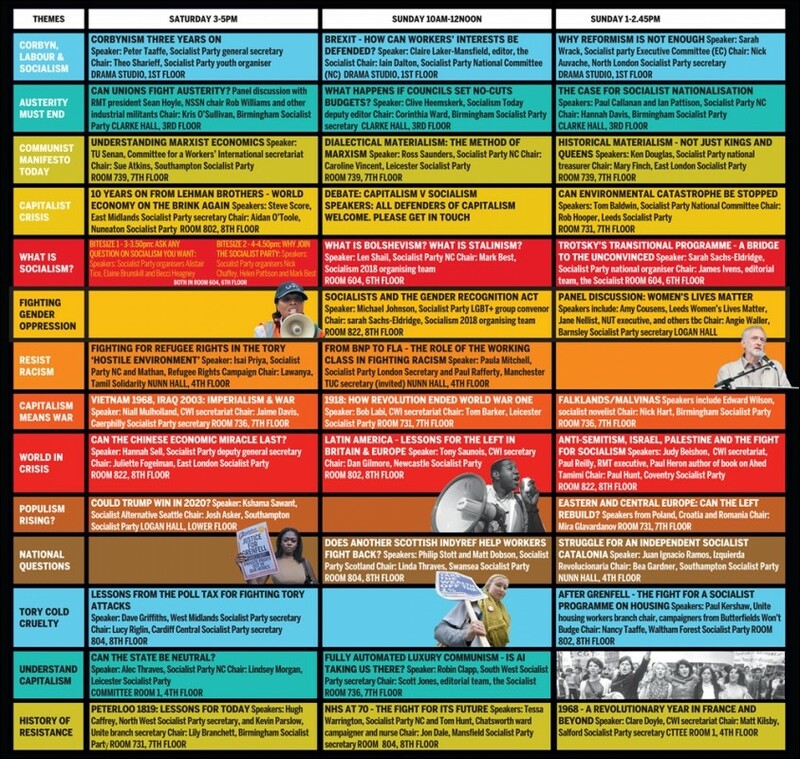 The Blairites are a fifth column within the Labour party. "The only way to counter them now is to build up a mass left wing, on a clear socialist and fighting programme. That's why we've applied to rejoin the Labour party. If the Co-operative party can join the Labour party why can't we, with our history of struggle?" Enthusiastic applause punctuated Peter's speech at regular intervals. 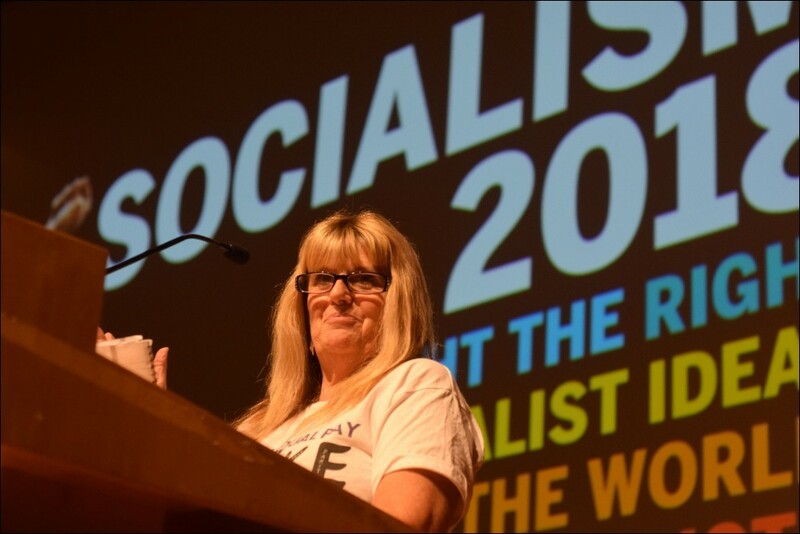 The confident mood continued as Sarah Wrack, from the Socialist Party's executive committee, made an appeal to those in attendance to make a vital donation to help support the party's work. She explained that the Socialist Party has no rich backers, and relies entirely on the sacrifices made by working-class people for finance. The response to this was tremendous - showing enormous generosity. An incredible £35,000 was raised or pledged. 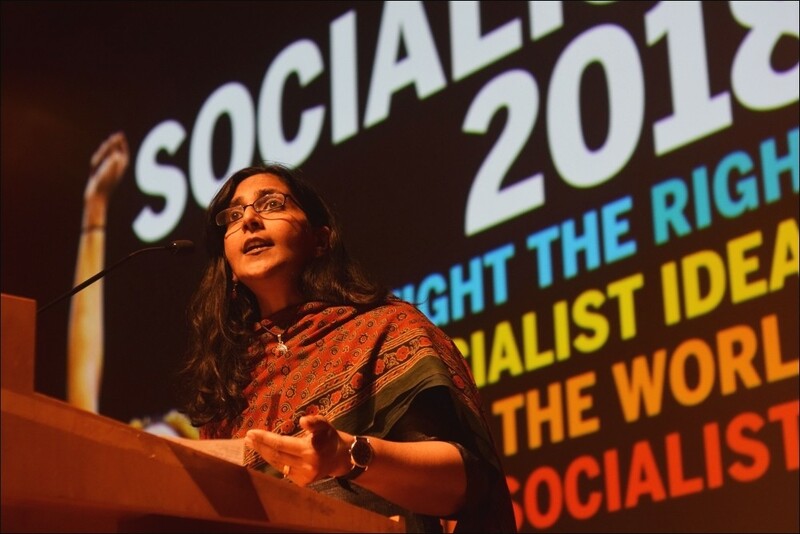 The rally's final speaker, Socialist Seattle City Councillor, Kshama Sawant, was eagerly anticipated by all in attendance. Fresh from the struggle against Trump - she described the huge radicalisation of a whole section of young and working class people in the US, and the incredible growth in support for socialist ideas. "The working class, socialists and young people today have an enormous responsibility on our shoulders. To defeat the right wing, its attacks on women, immigrants, LGBT+ people and crucially on the workers' movement. "But to do so we will need to build mass movements. But also raise the need for grassroots, working-class parties that are independent of corporate money and corporate power. "Because time is short. Under capitalism, billions of people are relegated to poverty and misery... We have seen capitalism's inability to even slow climate change let alone stop it... To do this, we will need a Marxist movement on every continent." 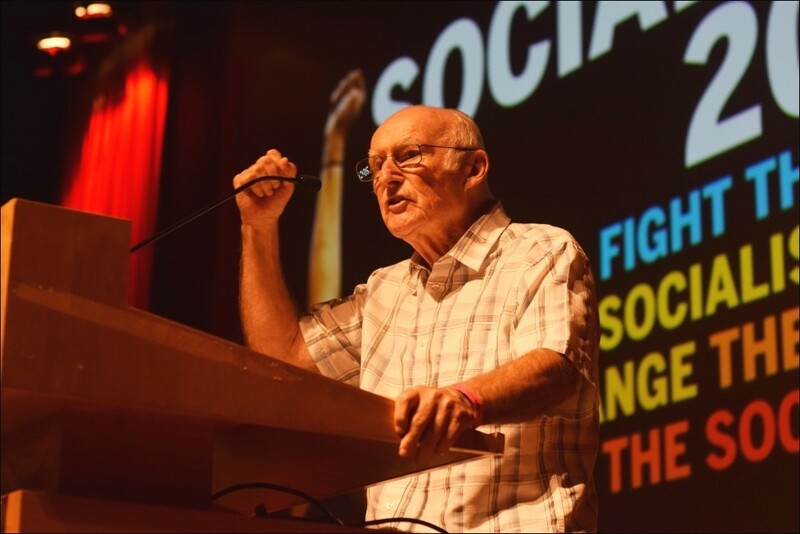 "A determined lead from Labour and coordinated action from the trade unions could defeat Theresa May and austerity - but Labour councillors not prepared to fight should stand aside", said former socialist Labour MP and Trade Unionist and Socialist Coalition (TUSC) chair Dave Nellist. 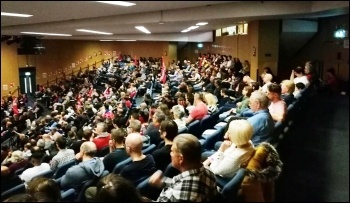 Three years on from the election of Jeremy Corbyn as Labour leader the theme of the Sunday rally of Socialism 2018 was organising political resistance to austerity. Tory chancellor Philip Hammond has claimed that austerity will soon be over. But we have seen the worst decade for wages since Peterloo almost 200 years ago! And local government cuts continue. Yet Labour councils alone have £14 billion in usable reserves that mean not a single cut needs to be made. It was to fight Tory and Labour austerity that TUSC was founded in 2010 by Bob Crow, the Socialist Party and others. Jeremy Corbyn himself attended a conference to discuss working-class political representation which led to the launch of TUSC two months later. Since then, TUSC has created a force of trade unionists, community campaigners and socialists that have fought against cuts and austerity and electorally has stood 2,500 candidates and polled over 375,000 votes. However, as Dave Nellist explained, while all component parts of TUSC remain committed to fighting austerity, there is not agreement on whether this campaign should extend to challenging right-wing Labour councillors at the ballot box in the May 2019 local elections. 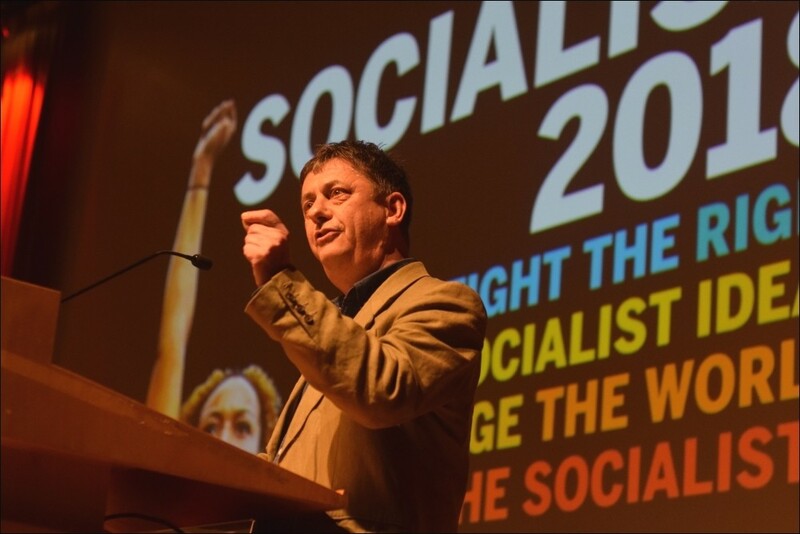 Therefore the Socialist Party will stand as Socialist Alternative at the ballot box in local elections to take on the worst of the Blairite cutters. This is linked to the Socialist Party's fight to transform Labour completely and support for Corbyn in the fight to do that. As Socialist Students chair Theo Sharieff said: "The students and young people who flooded to support Corbyn are the most desperate and impatient for Corbyn's programme. The Wetherspoon, McDonald's and TGI Fridays strikes are an echo of the colossal political earthquake that was the 2017 general election." 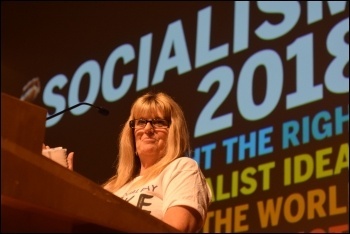 Marion Lloyd, PCS civil servants' union national executive committee member, speaking in a personal capacity, also pointed to the need to fight to implement Corbyn's policies when discussing the battle for the assistant general secretary position in the union: "Our opponents think that we only need to get a Corbyn government. But we also need a movement on the streets and in the workplace." A reminder of the importance of political representation for the working class, and of what can be achieved by elected representatives, was given by Paul Murphy, a Socialist Party Ireland member and sitting MP as part of Solidarity. He spoke of how he and other socialist MPs have used their position to "popularise campaigns, such as agitating for the non-payment of water charges, supporting workers in struggle, fighting for abortion rights and putting forward a socialist programme." 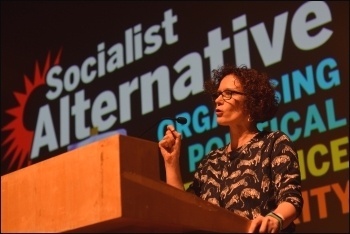 Closing the rally was Hannah Sell, Socialist Party deputy general secretary. Hannah described why the fight for socialism, whether on the streets, in the workplace or at the ballot box is so important: "A United Nations poverty envoy is currently visiting the UK and is hearing stories of how people are going days without eating. There is enormous anger and our role is to give that anger organised form. "When visiting a school in Glasgow a little boy told the envoy that the rich should pay!" She went on: "We can force the Tories from office but we also need to drive out the Blairites who do not stand for the many but stand for the few." 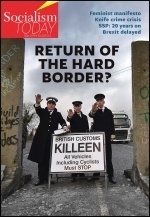 Paul Murphy said: "For many people it is easier to imagine the end of the world before imagining the end of capitalism. It is not only our job to imagine the end of capitalism but to help others imagine it too and imagine a socialist world." Click on the above image to see the programme of 37 smaller sessions that took place over the weekend on many different subjects. 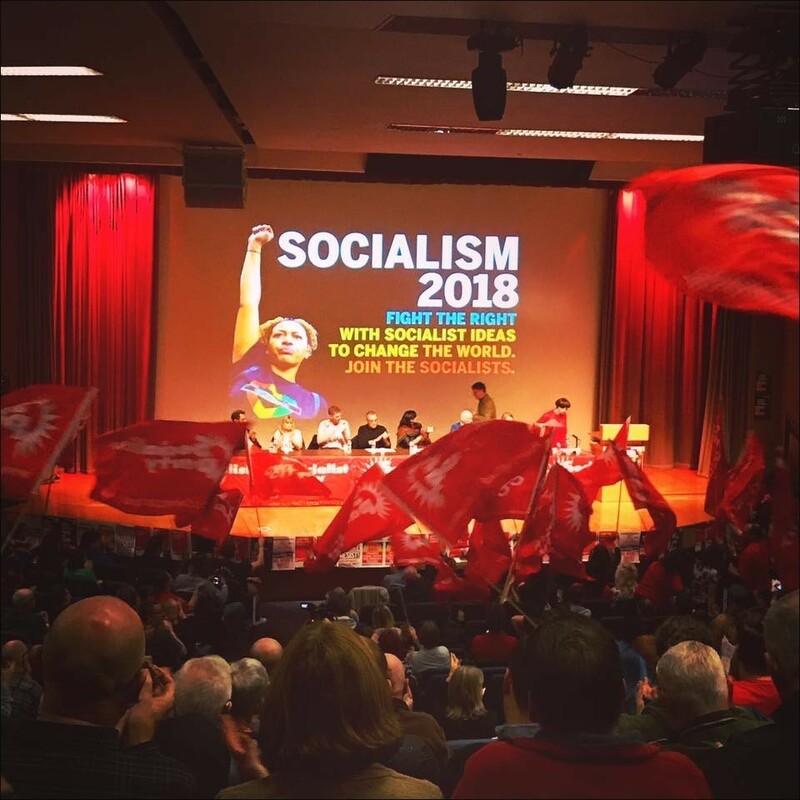 An amazing weekend at the Socialist Party's Socialism 2018 weekend. Two days of discussion, debate, workshops and rallies. The most enthusiastic and combative event like this I've been to in my seven years in the party. Proud to be a Socialist Party member. I've come away energised, enthused and ready to go out and continue my efforts to aid in the building of the forces of international socialism. 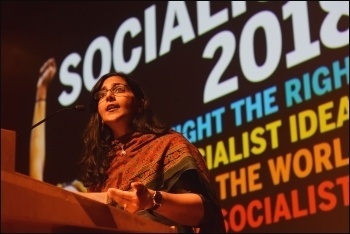 So inspiring to hear all the speakers at Socialism 2018, including the fantastic Kshama Sawant from Seattle speaking about the struggles of American workers and wildcat strikes. Something we should definitely import! 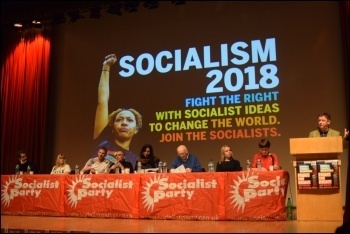 Fantastic weekend at Socialism 2018 - inspiring to not only have heard about struggles in Britain such as the Glasgow equal pay dispute and the Refugee Rights campaign, but also about the work of our sister parties across all continents! Had a great weekend at Socialism 2018. Amazing to hear from solid working class women fighters in our movement such as the Glasgow equal pay strikers. Onwards and upwards. What a weekend, love how even though we were all exhausted we still managed to laugh all the way back to Nuneaton on the train! Great weekend with great comrades, bring on Socialism 2019! Socialism 2018 was inspirational, exciting and of course educational. Yet again all the members in Wales want to thank the comrades for organising our event of the year and yet again all the comrades on the coach back to Wales were buzzing and could not stop talking about the whole weekend - and I can confirm that because they wouldn't let me have even a five minute kip! The discussions in the sessions were very inspiring. Hearing stories of ordinary working class people standing together to fight for socialist values has left me feeling hopeful for the future at a time when austerity seems never ending. 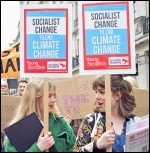 This version of this article was first posted on the Socialist Party website on 13 November 2018 and may vary slightly from the version subsequently printed in The Socialist.